Comedian and actor Milton was winner of the prestigious Perrier Best Newcomer Award at the Edinburgh Festival in 1996 for his first solo show, and returned in 1997 as a Perrier nominee. 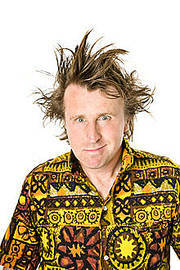 His first radio series, The Very World of Milton Jones was nominated for a British Comedy Award for best radio series in 1998, and his second series transmitted on Radio 4. This year, he has also recorded new stand-up sets for Four At The Store, Stand Up 2 and The Comedy Store. He has made numerous guest television appearances and starred as The Supervisor in the hit sitcom, The Strangerers. He continues to gig on the comedy circuit, where his act weaves threads of ideas with the tatter of his life to fashion a uniquely fetching jumper of obscurity! Milton is also adding many corporate clients to his growing fan base. When can I see Milton Jones?